Elvis is Elvis Presley's self-titled 1973 album. This album is often called The Fool album after one of the songs included in it, in order to differentiate it from the 1956 album of the same title. The album sold over 1 million copies worldwide despite it being released soon after the much more successful Aloha from Hawaii album. Fool and Where Do I Go From Here were recorded in March 1972. It's Impossible is a live recording from the Hilton Hotel in Las Vegas from February 1972. Tracks 3, 4, 6-10 were leftovers from the March and May 1971 recording sessions at RCA's Studio B in Nashville. 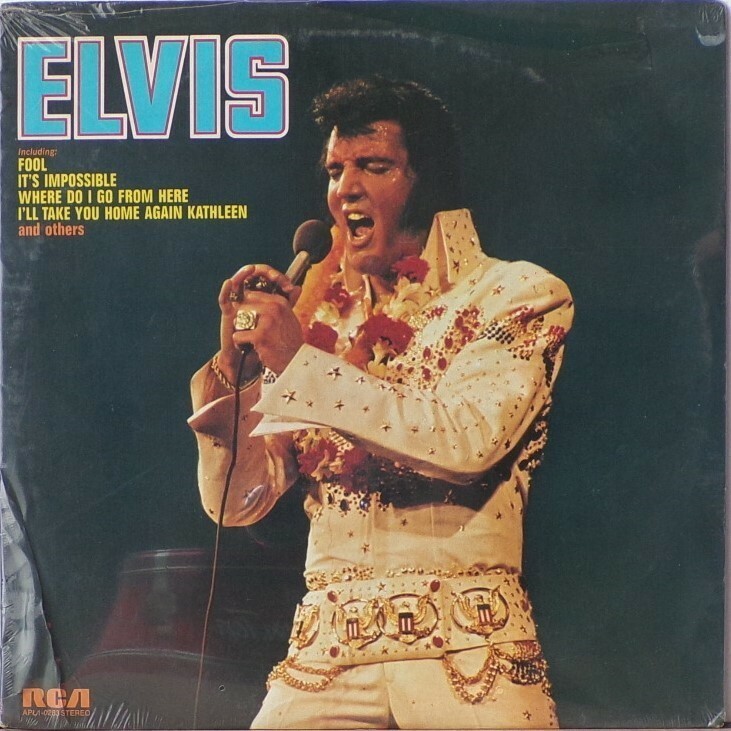 Three songs feature the King on piano: It's Still Here, I'll Take You Home Again, Kathleen and I Will Be True These three selections were all released together for a second time as part of the 1980 boxed set, Elvis Aron Presley. The song "Fool" was also released in this collection. Four other songs in this album were also reissued in other albums, as well; "It's Impossible" (Pure Gold, 1975), "Padre" (He Walks Beside Me, 1978), "(That's What You Get) For Lovin' Me" (A Canadian Tribute, 1978) and "Don't Think Twice, It's All Right" (Our Memories Of Elvis Volume 2, 1979). The title track "Fool" was issued as a single and managed to reach no 15 in the UK backed by a live version of "Steamroller Blues". On 12/1/2010 the album was certified 5 times Platinum by the RIAA. Front Cover : Photo of Elvis. Title top left. Catalogue number bottom left. 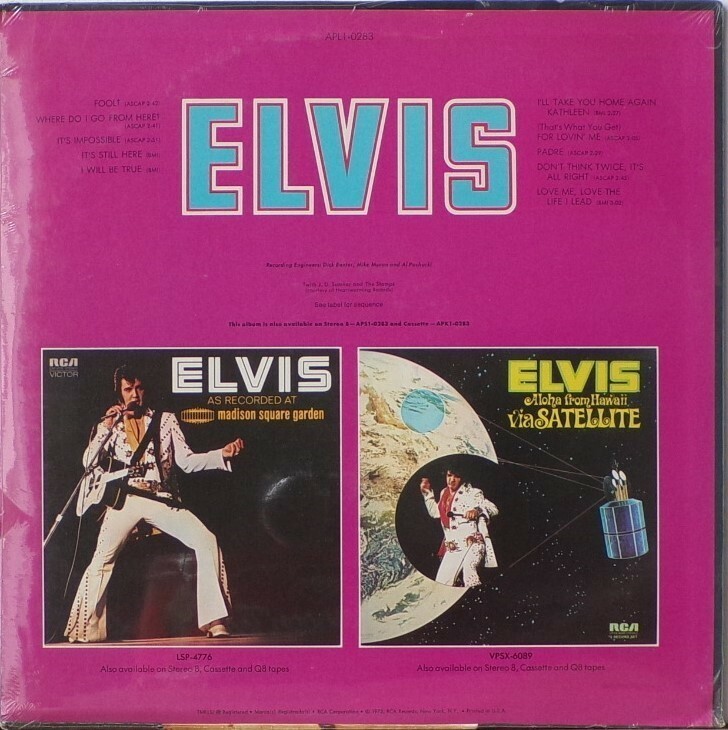 ​​Rear Cover : Advertising 2 Elvis live albums. Catalogue number top centre. Printed in U.S.A. bottom. *NOTE* This copy is sealed.